Manila, Philippines, December 15, 2015 /ChinaNewswire.com/ - AccorHotels launched the Novotel Manila Araneta Center in this October, bringing the world’s most recognized international business class hotel brand to the Philippines. Located within the Araneta Center, the premier lifestyle hub of Quezon City, the 24-storey hotel features 401 contemporary rooms and suites and an executive sky-lounge with a 360-degree view of the metropolis. The hotel offers the largest number of rooms in Quezon City to date. Novotel Manila Araneta Center is part of a massive development plan in the Araneta Center which is bustling with life and activities including weekend night markets, food festivals and street performances. The hotel opens at a time when tourism to the Philippines is growing fast, with visitor arrivals up 7.65% for the first half of the year, and just one month before the city hosts the Asia-Pacific Economic Cooperation Leaders Summit in November. The Philippines is known as the Pearl of the Orient and boasts six UNESCO heritage sites including the Palawan Underground River, one of the New Seven Wonders of the World. Located 15 kilometres from the airport, Novotel Manila Araneta Center is also a few steps away from light rail and metro rail stations, bus stops and jeepney terminals to places of interest such as the Sining Saysay Gallery in Gateway Tower 1, the SMART Araneta Coliseum, Gateway Mall and Ali Mall. The hotel is also situated near the re-opened Kia Theatre (formerly New Frontier Theater), a 2,500-seat indoor music performance and event space, and Gateway Tower 2, a dedicated facility for information technology, telecommunications and business processing-oriented companies within the Araneta Center, which will open in the first quarter of 2016. Novotel Manila Araneta Center is home to two new dining concepts. Food Exchange Manila is a 208-seat contemporary restaurant serving an array of international cuisine with dishes prepared at live cooking stations. Gourmet Bar by Novotel is perfect for those looking to enjoy refreshing signature drinks or simply relax with a novel over a cup of freshly brewed coffee. What stands out about the Gourmet Bar is its focus on using organic produce grown and harvested from a dedicated farm in San Mateo, Rizal. For relaxation, guests can also enjoy a workout at the hotel’s In Balance Wellness Center which includes a gym, spa and swimming pool. Young guests can head to the Gymboree Kids Area, a unique space on the fifth floor to explore and learn new things in a fun atmosphere. Whether it is meetings, conferences, parties or corporate retreats, the hotel boasts a state-of-the-art pillar-less grand ballroom, which can accommodate up to 1,200 guests, six meeting rooms and a boardroom. Its 2,500-square meter landscaped outdoor garden area is ideal for distinct cocktail events, soirées and fashion shows, and perfect for couples seeking to tie the knot in an open and romantic setting with a trellised garden and air-conditioned marquee. Novotel is the world’s most recognized AccorHotels brand for business and leisure travellers, with hotels located in the heart of major international cities, business districts and tourist destinations. 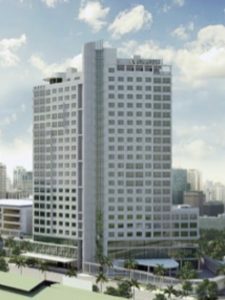 With over 100 hotels in Asia Pacific and five hotels in the pipeline for the Philippines, the opening of Novotel Manila Araneta Center reflects AccorHotels’ continued expansion in the region and will drive the growing demand for tourism and business in the vibrant hub of Quezon City. Novotel Manila Araneta Center will join a global network of more than 400 Novotel hotels and resorts in 59 countries. For more information, please visit www.novotel.com or www.accorhotels.com. – almost half a century of commitment to corporate citizenship and solidarity with the PLANET 21 program.